I remember the first time I started piling over the historiography of Greasy Grass/Little Bighorn at some point in 1999 or 2000, this with a short historical article included in one of those military history readers. This article happened to be by the late Stephen Ambrose (I think he published it sometime in the 1970s), and as a reflection of the scholarly times, it focused exclusively on what we call white military history. Looking back on it, and considering how even by the 1870s the American military was such a small cross section of elite Anglo-Americans that guided policy (as opposed to the lot of our non-English-speaking immigrant great and great-great and great-great-great grandparents who were entering the country at the time), it is much more accurate to refer to the traditional historiographic body of white 19th century American history as Anglo-American or Victorian Military History. This is not meant in a conspiratorial way. Rather, it is meant to point out how institutions are composed of individuals, and if the individuals within those institutions have certain outlooks on the world, then the institutions are going to operate accordingly. For at least a couple decades, now, enough individual scholars within the academies have created a social structure so that they can shift the direction of the scholarship (archaeologists are sometimes calling this “counter-modern” while other historians refer to it as multivocal). For example, instead of once again combing over what happened on June 25, 1876 at Greasy Grass, scholars have taken to looking at the conflict as a broader segment that needs to be contextualized in World History. James Gump has a work out there entitled, The Dust Rose Like Smoke: The Subjugation of the Zulu and Sioux (University of Nebraska Press, 1994), and it considers how the Anglosphere mythologized themselves after a confederation of Lakota, Cheyenne and Native America decimated the 7th at the Little Bighorn in 1876, and after the Zulu wiped out a British force of 1,500 at Isandhlwana on January 22, 1879. Check out the Zulu monument to the fallen Zulu at Isandhlwana with this link here. Isandlwana landscape from the Wikipedia public domain page. These broadened world historical treatments help pave the way for other scholarship (for example: so we’re not incessantly sitting around wondering what Custer did wrong; but rather what the Lakota and Cheyenne forces did themselves to bring about George’s demise). The latest and greatest public historical treatment of Greasy Grass comes by way of Debra Buchholtz’s The Battle of the Greasy Grass/Little Bighorn: Custer’s Last Stand in Memory, History, and Popular Culture (Routledge, 2012). This work gets the reader to think secondarily about the actual events of June 25, 1876, and primarily about how the public has remembered the events since 1876. It was, after all, a centennial year (from 1776 to 1876), and the general Anglo-American reading public was nonplussed and aghast to think that Custer (or anyone Anglo-American for that matter) would be capable of losing a battle within the interior of the American nation, and this so close to the centennial anniversary of the nation’s declaration of independence. 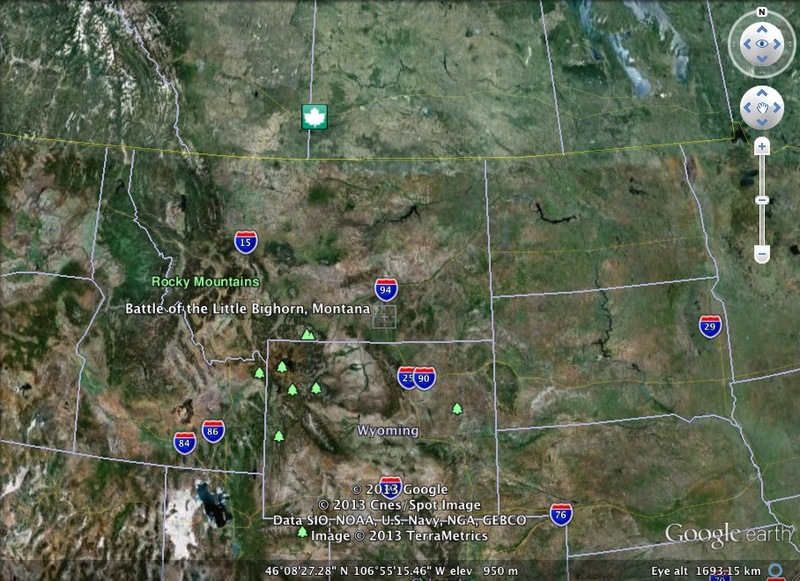 Greasy Grass/Little Big Horn from the Google Earth imaging. So this is where a lot of the contemporary scholarship is at these days: not just looking at the historical event itself, but also looking at what the popular press and academically trained thought about the historical event in and of itself (for example, William Blair and David Blight, among others, have taken a hard look at Civil War memory and memorialization in this way too). And that’s what I’ve kind of been thinking about on this 137th anniversary of the day the Lakota and Cheyenne (and others) stuck it to George at Greasy Grass in eastern Montana. In closing, I leave you with a paragraph quote from the 1986 work of James Belich, The Victorian Interpretation of Racial Conflict (McGill-Queen’s University Press, 1986 and 1989). This is so you don’t have to lug around numerous books while you’re taking in the various Lakota and Cheyenne holiday celebrations that commemorate the defeat of Custer at the Battle of Greasy Grass — Aaron Barth Consulting does this work for you. This entry was posted on Tuesday, June 25th, 2013 at 9:48 am	and tagged with Cheyenne, Debra Buchholtz, George Armstrong Custer, Greasy Grass, Isandlwana, James Belich, James Gump, Lakota, Little Big Horn, Montana, North Dakota, Public History, World History, Zulu and posted in Uncategorized. You can follow any responses to this entry through the RSS 2.0 feed.